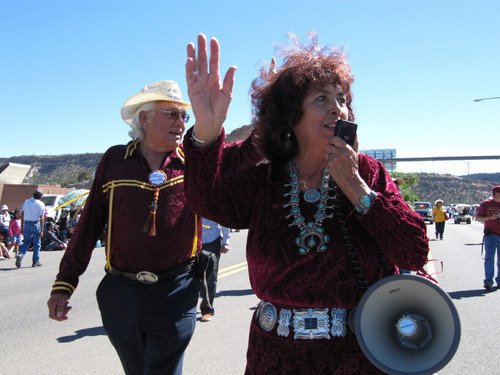 Window Rock, Ariz. • Lynda Lovejoy walks past throngs of parade-goers in her traditional, crushed velvet dress and moccassins, her campaign button on the sleeve. Speaking through a microphone, she says she'll bring fresh perspective to the Navajo government if elected president. Her supporters shout, "You go girl!" Others at the parade in Window Rock clearly don't want to see her at the helm of the country's largest American Indian reservation. "I hope you lose," one man shouts, then covers his mouth and ducks into the crowd. Another woman declares support for Lovejoy's opponent: "We want Ben Shelly. Women belong in the kitchen." No woman has served as Navajo president, although the matriarchal society has strong reverence for women as caretakers and heirs to everything from home-site leases to sheep. When introducing themselves, Navajos start with their mother's clan name. With Lovejoy garnering twice as many votes as any of the 10 men and a second woman in a recent primary, the Navajo Nation appears closer than ever to electing a woman as its leader. But that doesn't mean Lovejoy's candidacy is widely accepted as she and Shelly approach the Nov. 2 election. The New Mexico state senator has been called an outsider who lacks experience in tribal government. More to the point, she's been told she'll ruin a tradition in which all previous top leaders have been men and that her presidency could portend an ominous future for the tribe. Some have even attributed damaging weather events to her quest for the leadership. Still others have hope she'll bring attention to social justice issues and increase job opportunities for younger people on the reservation. Some ask why not a woman considering the tribe's struggles with men as leaders. Sara Stevens, who works with domestic violence victims on the reservation, says perpetrators are running rampant, and women and children need help. "She's a woman like the rest of us," said Stevens, of Crystal, N.M. "Hopefully that will pull at her heart strings." Men long have been the leaders of Navajo people and traditionally consulted with women in the communities as equals. Navajos see each person as having female and male aspects that create balance. Philmer Bluehouse, a traditional peacekeeper, said those who believe women can't be president likely are looking to a Navajo tale of a female who was given a leadership post but became angry and controlling. But some fail to look beyond that story to one in which the deity White Shell Woman gives birth to the Twin Warriors, who rid the world of monsters such as greed, poverty and hate, Bluhouse said. According to Navajo lore, all Navajos can trace their ancestry back to her, and she's considered to be the ideal woman. Both Lovejoy and Shelly know the story but are quick to note they're no experts in tradition. They are familiar, though, with "monsters" that come in the form of a more than 50 percent unemployment rate, the abuse of women and children, infighting in tribal government and neglected elderly. At stake in the race is oversight of the 27,000-square-mile reservation, its economy, future use of natural resources and the fight to maintain tribal sovereignty. Former Navajo president Peterson Zah said even with a win, Lovejoy's success would depend on whether she has the support of other women in the Tribal Council, who are outnumbered. The council is acknowledged as more powerful than the presidency. The excitement over having a woman in the race has faded, and Zah says, "now it's the whole question of 'Can Lynda Lovejoy govern if she's in that position ... how will she deal with these bigger Navajo Nation-wide issues?'" Lovejoy grew up in Crownpoint, N.M., where flat-lying land opens up to wide country with a distant, rugged ridge line. She shared a two-room hogan with 12 others and spent her days chopping firewood, herding sheep, hauling water and speaking Navajo. She left the reservation for college and spent a few years working for the Navajo government before entering state politics. While raising her three children as a single mother, Lovejoy said she lacked the spirituality to be strong and an effective parent, so she turned to Catholicism but still practices the traditional Navajo way of life. She also has five stepchildren. "You never leave your tradition," she said. "You learn it and it stays with you." 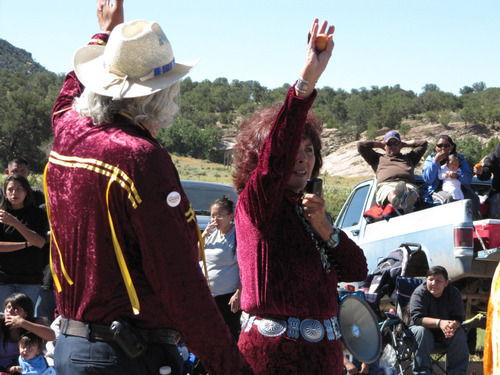 Some question Lovejoy's ties to tradition when she shows up in a business suit instead of traditional clothing, when they find out she is Catholic or married to a non-Navajo, she said. She's also disputed allegations that she's a drunk, a pervasive social ill on the reservation. She dismisses "mischievous" comments about her inclusion in the race, saying no respectable person grounded in Navajo tradition would air them in public. "Yes there are people out there who are struggling with that," she says. "But for the most part they are beginning to accept the fact that there's equal opportunities for women in leadership positions. Even in the presidential position." 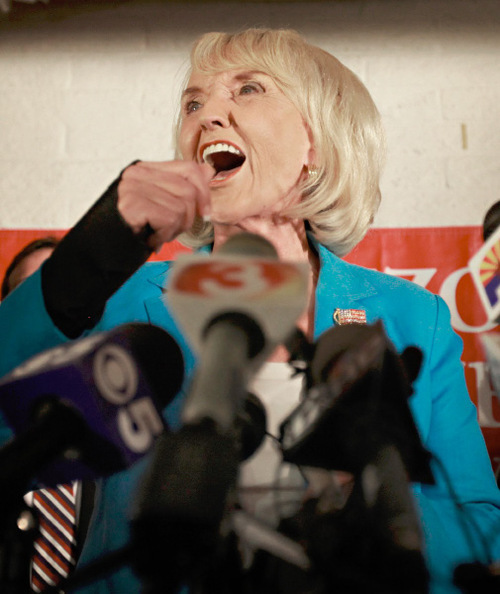 Four years ago, Lovejoy became the first woman ever to make it through the primary election but ultimately lost to current President Joe Shirley Jr., who is term-limited. In the years up to and since that run, Lovejoy has served in New Mexico state government as a senator, representative and member of a regulatory commission. As Lovejoy and Shelly crisscross the reservation that extends into Arizona, New Mexico and Utah, they must cater to wide-ranging interests. 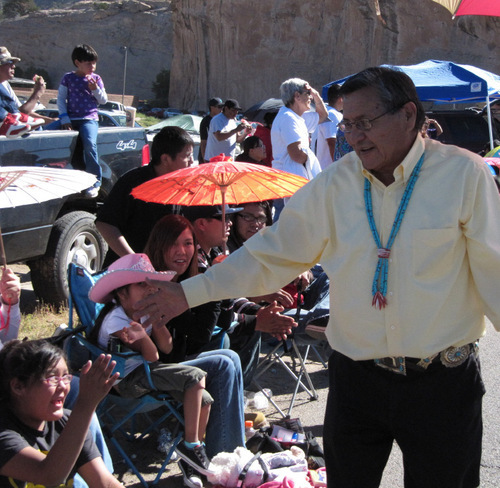 Younger Navajos want to see more of the candidates and their positions online, jobs, and money for scholarships. Elders who live in remote, scattered housing often without electricity or water want assurance the candidates will maintain traditions and speak fluent Navajo. Lovejoy's time in state government is what her opponent, Shelly, is relying on to give him an edge. He says she doesn't understand what Navajos truly need  someone who has spent more time in politics on the reservation than off  and she's lost the momentum she once had. That she's a female makes no difference to him. "I'm not even thinking about that," he said. "She's my opposition. She's in my way of my goal, my presidency. I've gotta beat her." Antonina Roanhorse, who is from the same community as Shelly's running mate, worries about the livelihood of a culture in which she was taught that women should maintain the home and care for the children, not seek the top elected office. 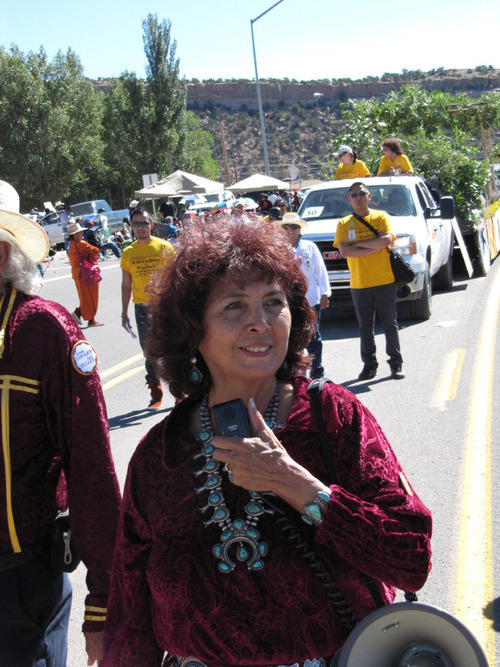 "Within Navajo culture and teachings, a lady shouldn't be running," said Roanhorse, of Rock Point, while awaiting the start of last month's Navajo Fair parade. "It should be the men who are protecting and leading." As she moves down the parade route, Lovejoy keeps a fairly straight path, embracing those who walk up to her. Shelly veers right and left, shaking hands in the crowd and wiping his brow with a towel. If one has more support than the other, it's not clear from the crowd's response. "When you grow up with traditional values, you can really feel the motivation in their speeches, and you stand up for them," said Joyce Tsinijinnie of Ganado, sitting with her husband on the parade route. "But I don't feel that for either of the candidates. We're open-minded, so we'll see what happens."